ATTRA has created a new, on-line pest management tool for farmers. This database highlights reduced risk materials that can be integrated with ecological pest management strategies. 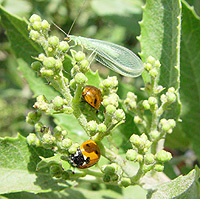 This page has links to specific pest management information. Many of the fruit and vegetable guides have information specific to pest of those crops (i.e. Grapes: Organic Production, has much information on grape pests), so if you’re unable to find what you need here, search for production guides in the appropriate section, or try the Ecological Pest Management D-base, which contains information about materials to help manage a wide range of pests, as well as information about prevention of specific pests. The idea behind this field guide was to provide a pictorial guide about the concepts of organic IPM and important pests and beneficials. The focus of the document is implementing ecologically-based strategies to prevent pests from becoming a problem in the first place. What is organic agriculture? This illustrated story briefly explains the ecological ideas behind this way of farming. It includes many sources of information about switching to organic methods.